10024 CCX 0MB Packaging Anti-Static Bags 2in x 4in SODIMM..
PS-050SD125-B L CCX 0MB Packaging tray with cover for 50 pc SODIMM..
NT512T64U88A0BY-37B AGT 512MB 240p PC2-4200 CL4 8c 64x8 DDR2-533 2Rx8 1.8V UDIMM RFB..
256MB 240pin DDR2 DIMM 32Mx64 non ECC gold leads unbuffered 1.8 volts PC2-3200 DDR2-400 spec 400Mhz with SPD CAS 3 latency CL3 max 1.25inches tall..
256MB 240pin DDR2 DIMM 32Mx64 non ECC gold leads unbuffered 1.8 volts PC2-4200 DDR2-533 spec 533Mhz with SPD CAS 4 latency CL4 max 1.25inches tall..
64MB 184pin Rambus RDRAM non ECC PC600 300Mhz with SPD 16 bit 2.5 volts 53ns 1.375 inches tall - priced per module so for kits buy qty 2 of this item..
64MB 184pin Rambus RDRAM ECC PC600 300Mhz with SPD 16 bit 2.5 volts 53ns 1.375 inches tall - priced per module so for kits buy qty 2 of this item..
64MB 184pin Rambus RDRAM non ECC PC700 350Mhz with SPD 16 bit 2.5 volts 3.2GB s 45ns 1.375 inches tall - priced per module so for kits buy qty 2 of this item..
64MB 184pin Rambus RDRAM ECC PC700 350Mhz with SPD 16 bit 2.5 volts 3.2GB s 45ns 1.375 inches tall - priced per module so for kits buy qty 2 of this item..
64MB 184pin Rambus RDRAM non ECC PC800 400Mhz with SPD 16 bit 2.5 volts 3.2GB s 45ns 1.375 inches tall - priced per module so for kits buy qty 2 of this item..
64MB 184pin Rambus RDRAM ECC PC800 400Mhz with SPD 16 bit 2.5 volts 3.2GB s 45ns 1.375 inches tall - priced per module so for kits buy qty 2 of this item..
Guaranteed Compatible! 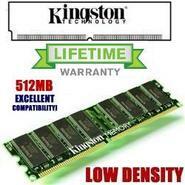 512MB DDR RAM PC-2700 Low Density-Desktop Memory..
Live Real Time Inventory SAVE 70-90%. M368L3223FTN-CCC AKF 256MB 184p PC3200 CL3 8c 32x8 1Rx8 1.8V DDR400 DIMM RFB..
V826632K24SCTG-D3 AKF 256MB 184p PC3200 CL3 8c 32x8 DDR400 1Rx8 1.8V UDIMM RFB..
MT4C3F44-60-ZPXX AAK 4MB 30p 60ns 3c 4x4 Parity FPM SIMM..
M470T2864EH3-CF7 CID 1GB 200p PC2-6400 CL6 8c 64x16 DDR2-800 2Rx16 1.8V SODIMM RFB..
8MB 72pin FPM DRAM SIMM 2Mx32 non-parity tin leads 5 volts 60ns 16 chip count 1x4 max 1.0inches tall - refurbished..
32MB 168pin SDRAM DIMM 4Mx64 non ECC gold leads unbuffered 3.3 volts PC100 spec 100MHz with SPD CAS 2 latency CL2 4 or 16 chip count max 1.25inches tall - odd lot of singles only left in stock..
32MB 168pin SDRAM DIMM 4Mx64 non ECC gold leads unbuffered 3.3 volts PC66 spec 66MHz with SPD CAS 2 latency CL2 16 chip count low density 4 clock Intel Ver max 1.0 Compliant max 1.25inches tall refurbished - odd lot of singles ..
32MB 144pin SDRAM SODIMM 4Mx64 non ECC gold leads unbuffered 3.3 volts PC100 spec 100MHz with SPD CAS 2 latency CL2 4 or 8 chip count max 1.25inches tall..
32MB 144pin SDRAM SODIMM 4Mx64 non ECC gold leads unbuffered 3.3 volts PC66 spec 66MHz with SPD CAS 2 latency CL2 4 or 8 chip count max 1.25inches tall..
32MB 144pin SDRAM SODIMM 4Mx64 non ECC gold leads unbuffered 3.3 volts PC100 spec 100MHz with SPD CAS 2 latency CL2 4 chip count max 1.25inches talls 8x8 dram..
32MB 144pin SDRAM SODIMM 4Mx64 non ECC gold leads unbuffered 3.3 volts PC66 spec 66MHz with SPD CAS 2 latency CL2 4 chip count max 1.25inches talls 4x16 dram..
128MB 184pin DDR DIMM 16Mx64 non ECC gold leads unbuffered 2.5 volts PC1600 DDR200 spec 200Mhz with SPD CAS 2.5 latency CL2.5..
128MB 184pin DDR DIMM 16Mx64 non ECC gold leads unbuffered 2.5 volts PC2100 DDR266 spec 266Mhz with SPD CAS 2.5 latency CL2.5..
128MB 184pin DDR DIMM 16Mx64 non ECC gold leads unbuffered 2.5 volts PC2100 DDR266 spec 266Mhz with SPD CAS 2 latency CL2..
128MB 184pin DDR DIMM 16Mx64 non ECC gold leads unbuffered 2.5 volts PC2700 DDR333 spec 333Mhz with SPD CAS 2.5 latency CL2.5..